The political economy of change: A trade off between political freedom and economic growth? Political uncertainties and economic confusion characterised the first four months of this year. Uncertainty of what lies ahead after a parliamentary election will slow down economic growth in 2015 to 6.5 per cent or below compared to the 7.4 per cent achieved in 2014. Does this mean that 2015 is a lost year for the economy? The cutback in government investment in infrastructure, much of which was funded by foreign debt, is one reason for the decline in economic growth. This is not altogether detrimental to the economy, as the costs of these projects were inordinately high and their benefits uncertain, small or negligible. No proper evaluations were done in almost all of these projects, and in some, like the Mattala airport, there are further costs rather than any evident benefits. However, the stoppage of such investment retards growth. Growth in several sub sectors of the economy, such as construction, import trade and public services, will slow down owing to a change in policies. This is a readjustment in economic strategy to avoid huge foreign debt and macroeconomic instability. Therefore, the setback to growth, though painful in the short run, as it has resulted in losses in employment and affected livelihoods, is not unfavourable in the long run. New government investments are not likely by the transitional government owing to the stringency of public funds. The reallocation of government expenditure to social infrastructure, health and education will benefit the economy in the long run but its immediate growth impact is small. Increased private investments and foreign investments are likely only after a stable government is formed after parliamentary elections. The decline in growth is, however, not only due to this readjustment in policies. Some policies adopted by the interim government were detrimental to business confidence and investment. Several features in the interim budget were ill thought out and disincentives for private investment. Confusion and uncertainty in economic policies and poor economic administration, too, have been detrimental to investment. Investors are awaiting more stable political conditions, certainty of regime change and predictable policies. Investor diffidence has been reflected in the Colombo Stock Exchange that has seen a declining trend in prices and outflows of foreign investments. The government’s expectation of larger foreign direct investment for export manufactures would have to await political stability and certainty and predictability in economic policies after the parliamentary election. Developments beneficial to the economy include foreign policy initiatives to build bridges with important trading partners. Manufactured exports, especially garments, are likely to benefit by the expected reintroduction of the GSP Plus concession in the EU. Fish exports will benefit from freer exports to the EU. However, bigger benefits can come from policy reforms in trade, regulation and the financial sector than by increasing access to Western markets alone. The more favourable foreign press is likely to help tourism. The passing of the 19th Amendment to the Constitution almost unanimously has instilled a degree of confidence in the polity. The rule of law that is a fundamental prerequisite to economic development will have an important impact on economic development in the long run. Broader considerations of political economy are as important as the impact of the political changes on the economy. Recent developments have to be viewed from the perspective of all aspects of national development rather than from an entirely economic perspective. The defeat of the previous regime was a monumental political transformation that has improved the quality of life, especially the freedom of expression, the restoration of the rule of law and the restoration of a democratic polity. There are two dimensions to the economic programme of the new regime. One was to grant concessions to people by bringing down prices of essential goods and this was as much a part of the political strategy as an economic concern. The second dimension was the reordering of economic priorities and cutting down conspicuous wasteful government expenditure and increasing allocations for education and health. A substantial decrease in prices of petroleum, gas, electricity and of 13 basic food commodities has been achieved. Despite this, there is discontent owing to the political bias of some segments of the population who say that prices have not fallen adequately. Some prices have not fallen despite the measures taken by the Government owing to non-compliance of traders and is the economic phenomenon called the ‘ratchet effect’ of prices remaining high as downward readjustments are tardy. Further price concessions before the parliamentary elections could be detrimental to the fiscal and trade balances and would affect the economy adversely. The setback to economic development on the basis of the conventional criterion of GDP growth should be tempered by longer term economic perspectives and an evaluation of the new directions of economic policies for development. 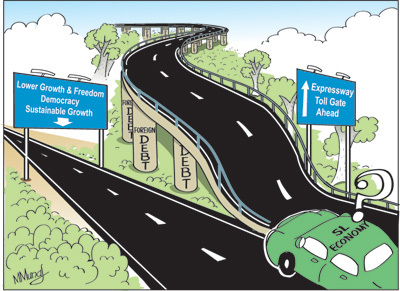 The sources of economic growth, the economic reforms of the new regime, the prioritisation of expenditure and cutting down of huge expenditures on projects that are of little or no benefit and reducing wasteful ostentatious government spending have to be reckoned in a qualitative assessment of economic development. It is also important to reflect on the gains in political freedom, improvements in law and order, the enforcement of the rule of law and the resuscitation of a democratic polity in judging the performance of the government. Economic growth alone is an inadequate measure of economic, political and social development. Steps have been taken to curtail waste and readjust expenditure. While benefits of these would be reaped in the fullness of time, the costs of the reduced wasteful expenditure are a loss of the growth momentum and increases unemployment. The reorientation of public expenditure would be of economic and social benefit in the medium and long term. Had the large investment in infrastructure continued it would have affected the county’s long term economic development adversely, aggravated the foreign debt problem and distorted public expenditure in a manner that could have had adverse effects on the economy and society. The economic setbacks were inevitable readjustments to a new economic and political order towards a more sustainable economic growth momentum. Has Heaven’s malice granted Jayalalithaa’s political prayers?